Bombays are known for their short, sleek coats that come only in black. Their eyes are gold to copper in color. This medium-sized, muscular cat also has black nose leather and paw pads. 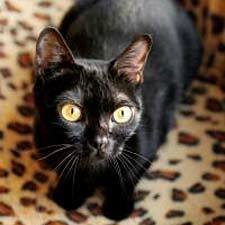 Bombays are happy, friendly cats who love to play and interact with humans and other pets. Many can be trained to go outside on a leash, and like to play fetch with a small ball, catnip toy or crumpled up piece of paper. Although they tend to be busy cats, they also enjoy cuddling up and are intelligent and affectionate. They like strangers and children. Bombays are social cats and like a lot of attention. They are sometimes mistaken for Burmese. Bombays are active cats and need plenty of stimulation. The Bombay was first developed in the 1950s by a Louisiana breeder named Nikki Horner. She aimed to create a breed that resembled a small panther, and used certain American Shorthairs and Burmese to obtain an all-black, copper-eyed cat. In 1976, The Cat Fanciers Association granted Championship status to the Bombay. The International Cat Association considers the Bombay part of the Burmese group. The breed is also recognized by the American Cat Fanciers Association. All three registries allow the crossbreeding of Burmese and Bombay.